Predestination is both a time-bender and a gender-bender. This slick sci-fi flick opens with the question: If you could be guaranteed to kill the man who ruined your life, would you? The answer of course, has a catch. 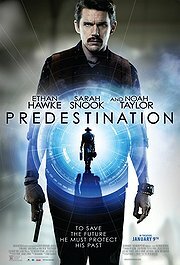 What that catch is, and how it is revealed and resolved is what makes Predestination so intriguing. Writer/directors Michael and Peter Spierig, adapting Robert Heinlein’s story “All You Zombies,” set their tale in multiple time periods, and at a time when the “fizzle bomber” is on the loose. A man (Ethan Hawke) is on a mission to stop the bomber, and to do so, he takes a job as a bartender in 1975. He meets a patron (Sarah Snook), who looks like a man but is actually “The Unmarried Mother,” a writer of a magazine “confessions” column. She confesses a helluva story to the Bartender about her own life. This tale, involves her growing up in an orphanage, learning how to fight, and achieving academic excellence in math and science. Her skills impress Mr. Robertson (Noah Taylor) who suggests she become involved in the Space Corp program. As she excels in her training, a situation develops that changes her life, literally, yet again. 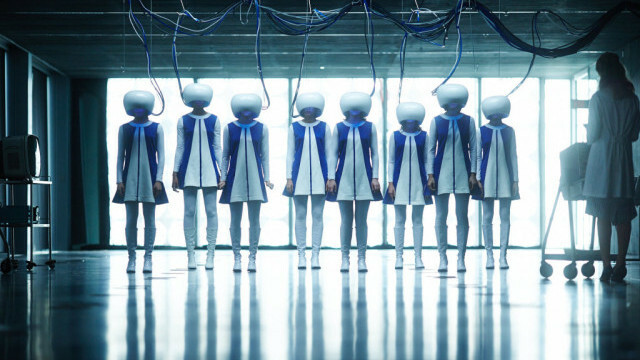 Predestination is best in this first half, as it sets up the film’s various plots and characters that intertwine, overlap, and sometimes even converge in the film’s trippy second act. It is hard to discuss what transpires without spoiling the details, but for viewers who make the narrative leaps as the Bartender and The Unmarried Mother travel back and forth in time to possibly kill the man who ruined her life the film can be quite satisfying. For others, it may just be head-scratching. The Spierig brothers, however, forge ahead regardless, raising questions about fate and difference with every plot twist (or contrivance). While Ethan Hawke is charming as the Bartender, he gives a somewhat serviceable performance in the film, in part because his role does not require him to do much. Most of the film rests on Sarah Snook’s shoulders and she is particularly impressive here playing multiple roles and being distinguished in each of them. This modest film’s visuals are quite stylish, offering Edward Hopper-esque images and some fine period details and costumes. It is even amusing that the film’s time machine is a violin case. Predestination may be a bit talky for action fans, but it is mostly engaging, and a, for a time-travel film, it is a passable time filler. Predestination opens today in Philly area theaters.